Long out-of-print album. Beautiful DigiPaks redesigned under the guidance of Mortiis. 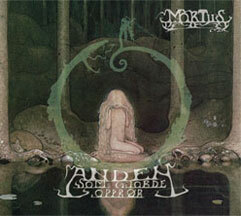 Mortiis’ earliest recordings, back in print! Mortiis makes headlines world-wide with his current industrial-metal sound. Projekt returns to his roots with classy digi-pak redesigned reissues of his 2nd and 3rd albums from 1994 and 1995. As a member of Emperor, Mortiis was one of the notorious members of the fantastic and fanatic Norwegian Black-metal scene. Through a natural evolution, Mortiis made his way into the dark-electronic scene. These long, thoughtful pieces present a regal yet ancient mood; as if the soundtrack for ancient castles filled with forlorn kings looking out upon their lost kingdoms. Words are spoken in Norwegian, drifting into the background ambience.